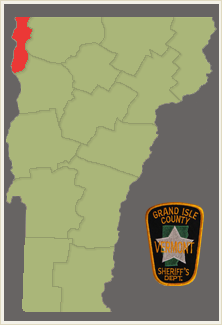 Grand Isle County is Vermont's only water surrounded county. It is situated on Lake Champlain in a chain of islands from around Milton to the Canadian border. Grand Isle is Vermont's smallest county with 189 square miles with approximately 7,000 people Grand Isle's shire town is North Hero. Located in the northwest corner of Vermont, Grand Isle County is comprised of five townships connected by bridges, and has over 7,000 full time residents. The population increases by almost five times in the summer months, as many people reside at their seasonal camps along the lake shores. Grand Isle County is home to five VT state parks, and provides over 100 square miles of boating and fishing on Lake Champlain. The Grand Isle County Sheriff's Department is located in North Hero, and provides primary law enforcement services to the entire county.